Jared and I had been planning some island hopping around the Bahamas for quite some time. 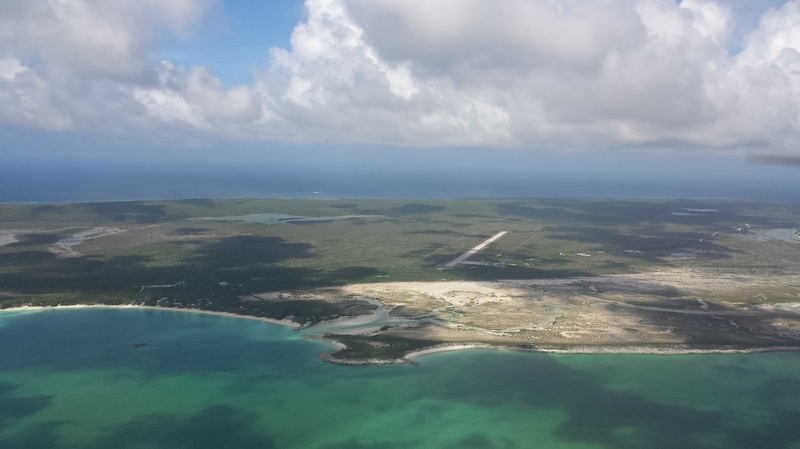 If you remember, we were ready to go in June of 2015 but the repaving and closure of Staniel Cay's runway (and, consequently, only airport) made us change plans and headed westbound instead. That trip was summarized in the "Texas, New Mexico, Arizona, and California in 12 Days" blog. But, this time, all the stars aligned and, in late June 2016, we spent a few days island hopping. Truth be told... Jared was not extremely excited because he had flown to the Bahamas for work (as a former regional airline pilot) many times and felt like "he had been there, done that!" Ok, maybe flying over water in a single-engine aircraft (he normally flies an aircraft with four!) had him a little worried as well. If it was up to him, we would have taken a twin. 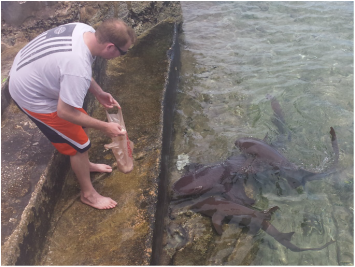 On the other hand, I had never even been to the Bahamas and I must admit that, after hearing people's tales of their Nassau and Freeport experiences (flying or cruising), I really was not very enthused either. I always told Jared that it was going to take a visit to the Outer Islands in a general aviation aircraft for me to visit the Bahamas at all. I had heard plenty of awesome stories and read plenty of awesome articles about that! And, yes, the experience did not disappoint! Quite the contrary... we absolutely loved it and we're already thinking about a future visit to some of the other islands we did not get to on this trip. We knew we could fly from point A to point B without a problem; however, the whole Customs and Immigration paperwork and procedures had us a bit worried. They make it seem pretty black and white. You either have it or you don't. If you don't, you're in trouble - in a lot of trouble! I felt like most articles, training, and information I had read really instilled a bit of fear in me and discouraged me from even attempting this journey. I understand we needed to have all documentation with us but, if we forgot something or just didn't have something, we really didn't mean it! A last minute change in aircraft ownership also added to the paperwork needs. So, anyway, we ensured we had absolutely every required piece of equipment and document that applied to us (ourselves, the aircraft we flew, and the luggage we took with us) to avoid issues (and possible penalties). It was quite a bit! - We also rented a life raft in Florida. This is not required but nice to have should you need it. - Cash is king! U.S. dollars are accepted everywhere and it may keep you from paying international fees on your credit card. You will, for sure, need cash to pay the Bahamas departure taxes ($29 per person). - I enrolled in the electronic Advance Passenger Information System (eAPIS) for international operations. Taking AOPA's eAPIS online course was super helpful as well. I highly recommend it! Because this is not a comprehensive list and is only what we were required to take with us. 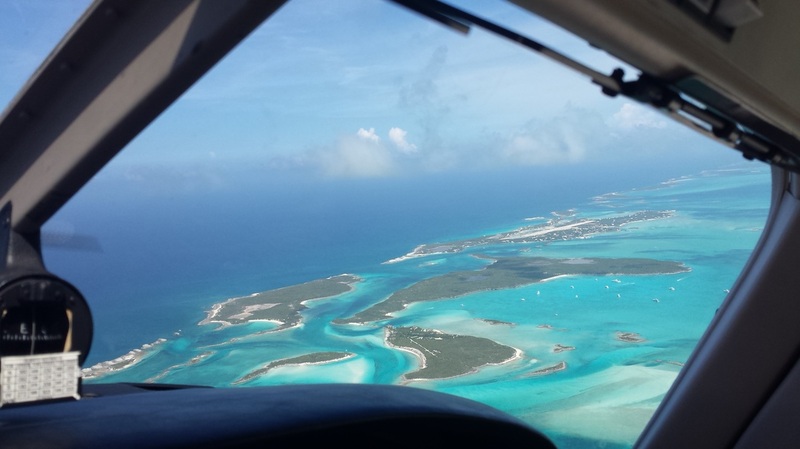 Review AOPA's "Flying to the Bahamas" website and The Islands of the Bahamas's "private flying" website for more helpful information and even hotel/resort discounts. Also... if you plan on going to any of the big shows (mainly Oshkosh and Sun 'n Fun), look for the Bahamas booth. They normally have free charts and things you can take with you. They are not necessary (we used ForeFlight which had everything we needed as far as flying and flight planning is concerned) but good to have! And, if you still don't have enough with that, PilotPub offers great, printed resources for a fee. Personal advice... make sure you bring plenty of sunscreen and heavy duty bug spray with you. You're going to need it and it's expensive to purchase on the islands (not to mention they may not have exactly what you're looking for). And, one more, practice your crosswind landings and be ready for very changing winds (almost wind shear at times) while landing. On occasion, I came with a little extra speed and less flaps to be on the safe side and be better prepared for a go around. The first leg was a normal one, challenging by a bit of weather enroute. We stayed mostly underneath it so we could see it and dodge it. Once closer to the destination, we ended up changing it to Stennis, MS (KHSA). Work prevented us from leaving Houston sooner, pushing our "ferry" trip back quite a bit. The aircraft and the crew needed refilling and we felt Stennis would be a quicker stop than Gulfport (KGPT) since HSA is less busy and the FBO (Million Air) has an onsite restaurant. BTW - The pilot gets free lunch with a top off! 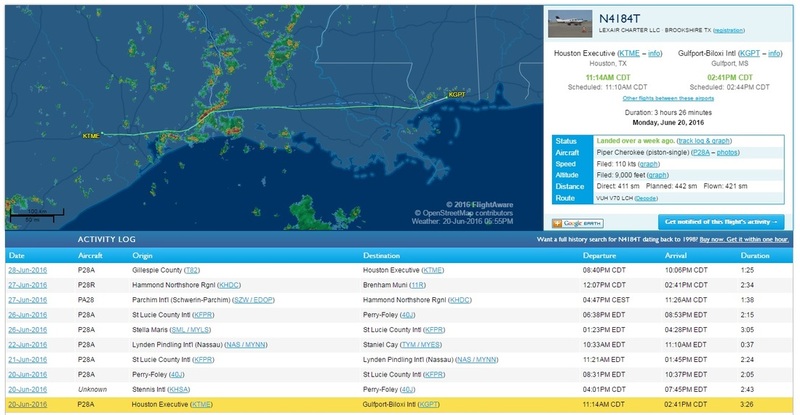 After a fairly busy leg from Houston to Stennis, the flight from Stennis to Perry-Foley (40J) was really uneventful. Fine by us! 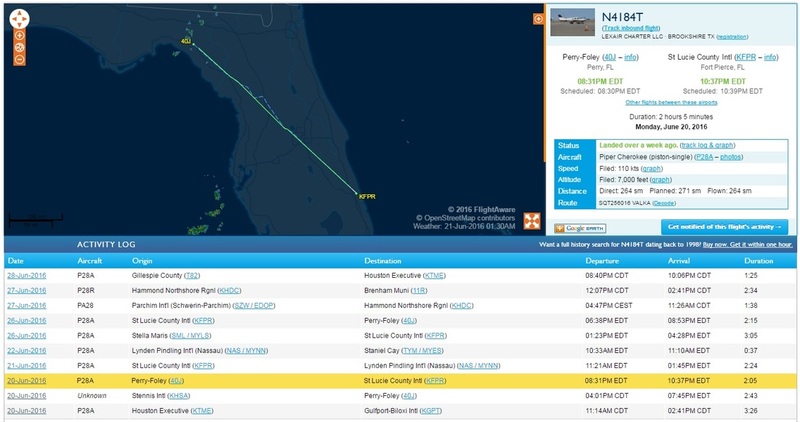 Leg 2 was so uneventful that we felt rested enough to keep going all the way to Fort Pierce (KFPR) that night. It sure helps to have two pilots on board, too! I'm not a big Disney fan but we enjoyed flying over DisneyWorld and seeing their daily fireworks from the air. This was definitely one of Jared's trip highlights. He rarely takes videos of anything and he took one of the fireworks. 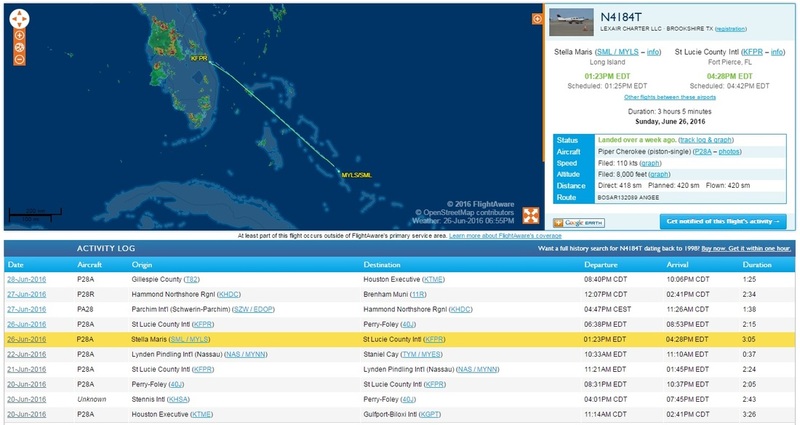 Our intention was to only fly to the "Outer Islands" and skip the busy, more touristic and more expensive locations (like Nassau and Freeport) so we planned on flying to and clearing Customs at Fresh Creek. A friend of ours discouraged us from clearing in Bihimi (while it's the closest island to the U.S., there is nothing to see and it may be a little unsafe, she said) and instead suggested Fresh Creek as a quick and easy place to stop at. However, the necessity to purchase fuel (Fresh Creek doesn't have fuel) and weather made us change our mind. Better safe than sorry! 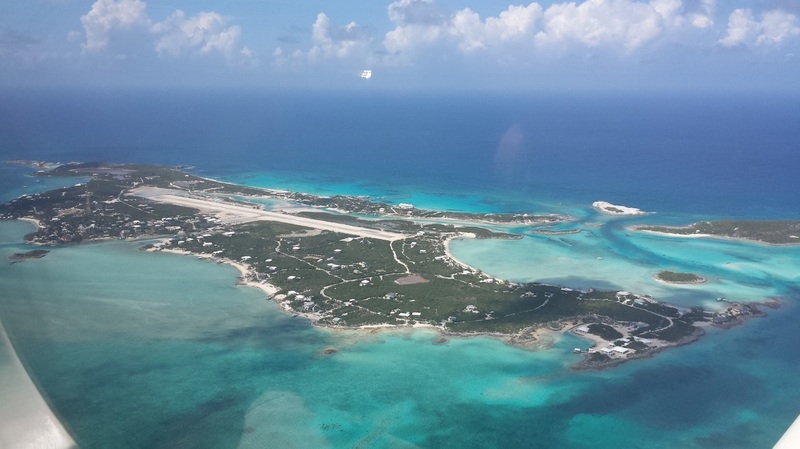 Only two airports in the Bahamas - Nassau and Freeport - have instrument approaches. Most of the airports don't have good weather reports so, when in doubt, play it safe! We filed an international IFR flight plan with the Flight Service Station (FSS) via a dedicated number they had listed in APP Jet Center's flight planning room. 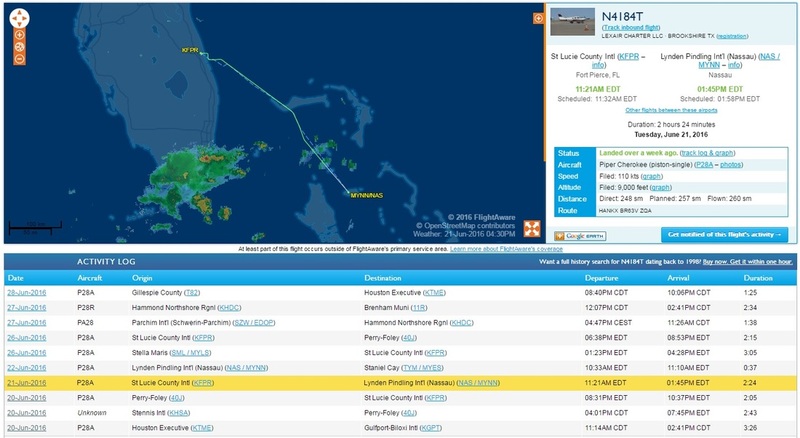 We filed to Nassau (MYNN) via Freeport with Freeport (MYGF) as the alternate (the weather looked good there). Miami Center had us flying straight over the water as soon as Tower transferred us to them but we much preferred gaining altitude closer to land. We requested it and got it approved. Perfect! 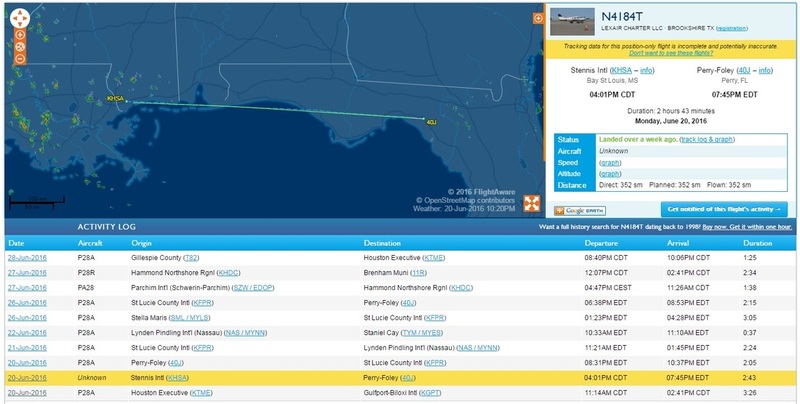 You can see our southerly turn in the FlightAware image below. Once enroute, we calculated our "point of no return" given winds/speed/distance, discussed landing options, looked for boats, and discussed ditching procedures again. 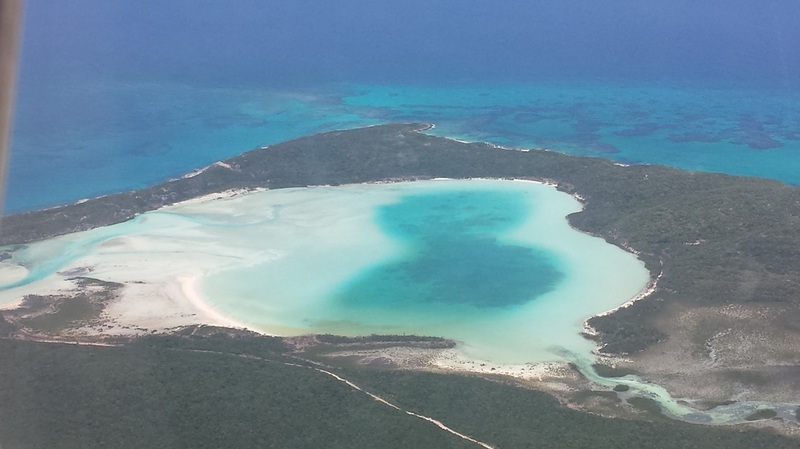 A happy tear or two may have come out of my eyes when I first saw the beautiful Caribbean waters. Who would have thought (some years ago) I would be going on this awesome trip with my awesome husband. It felt great knowing we were doing this alone. All the hard work had paid off and it was totally worth it! A few more minutes went by and Freeport appeared (see picture below). We confirmed that could be our alternate airport. In fact, the private airport on the west end looked good as well (see picture below). ​From Freeport to Nassau, the weather got a little interesting and we had to go around some cells (but, hey, so did the airliners). 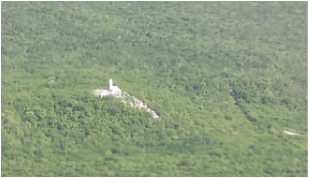 But things got better as we got closer to Nassau and, while we did fly to MUNIE intersection, set up and start the approach to runway 14, we were able to execute the visual to the runway after descending through some clouds (see landing picture below). 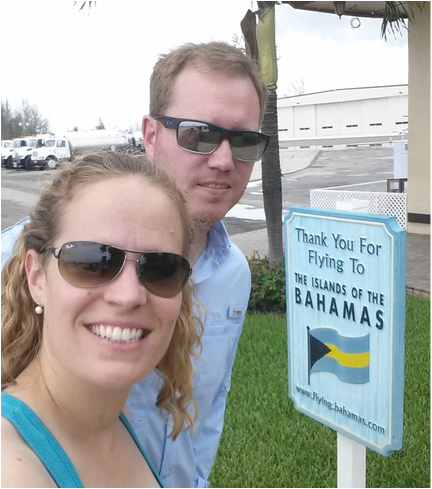 We cleared Customs in Nassau after taking the celebratory picture by the "Thank You for Flying to the Islands of the Bahamas" sign (see below). It was an easy, laid back process and we actually had to remind them that they needed to stamp our cruising permit to avoid issues on the other islands. They did not ask for any of the other documents. Nassau was definitely the least pretty, least enjoyable, and most expensive stop (airplane wise) for us but I would do it again given our situation. Oh well! Sometimes you win, sometimes you lose but, if you can, skip it. At least we didn't have any hotel reservations we had to forgo. And talking about hotel reservations... we didn't make any for the entire trip to give us flexibility (mostly weather and maintenance related). We booked as we went; however, I did make sure they had available rooms before launching there. Most outer islands only have a place or two to choose from and none of them had too many rooms/cottages. In addition, some require you to book a minimum number of nights. 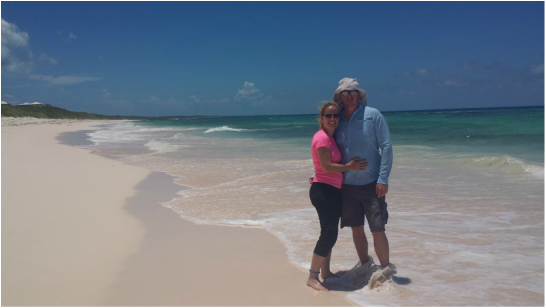 We did not do too much while in Nassau but we did enjoy some down time on Cable Beach, had lunch (you guessed it! conch!) at a local restaurant on Arawak Cay, and walked all the way from the west end of Cable Beach to downtown Nassau (we took the local bus on the way there). Nassau implemented new procedures in 2015 where all aircraft must file a flight plan (VFR or IFR) within 25 NM of the Airport and we felt that filing IFR would be easier for us and, looking back and seeing how low the clouds were, I do think that was a good decision. Jared and I had established 6,000 ft as a good altitude for us to cruise at over water. VFR was not going to give us that. 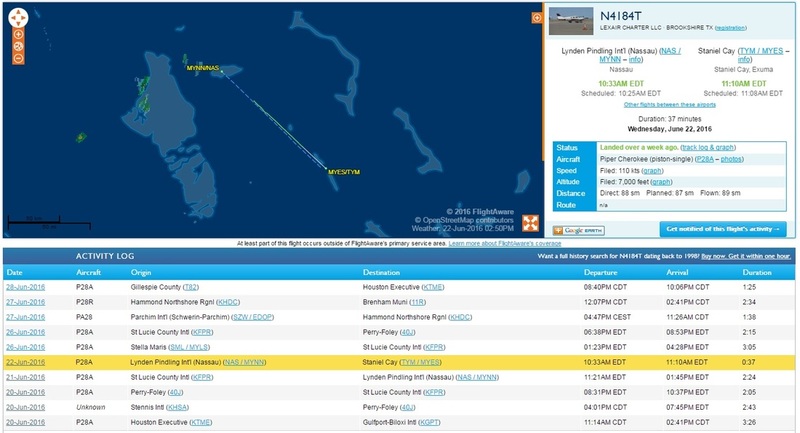 BTW re: communications - We talked with either Nassau Approach or Miami Center most of the time we were flying around the islands. We enjoyed having them on the frequency in case something happened and for the eventual traffic advisory. We also always monitored 122.8 on the second radio (and had 121.5 on standby) as it is the CTAF frequency for all the airports we went to (and maybe all non-towered Bahamian airports, actually). For that reason, it is especially important to pay attention to the airport they mention at the beginning of their transmission. Most GA pilots just talked on that and relied weather reports on it sometimes too. We made note of the fact that there was a lot of traffic in and out of Marsh Harbour. We didn't make it that far north on this trip but it's on the list for the next one. Lots of traffic may mean it's worth going? 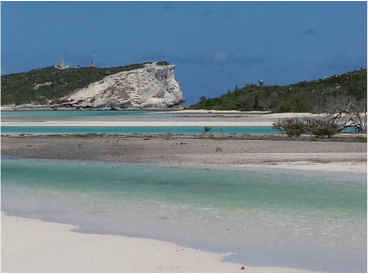 ​And, yes, we were finally in Staniel Cay! They did what to the runway? It seriously did not seem less than a year old to us! 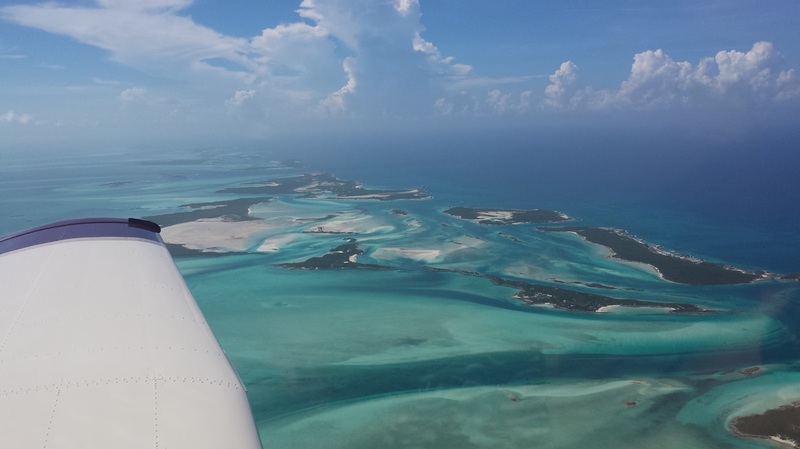 The chain of islands known as the Exumas have to be the prettiest islands in the Bahamas or, at least, from the air. Wow! They are stunning! 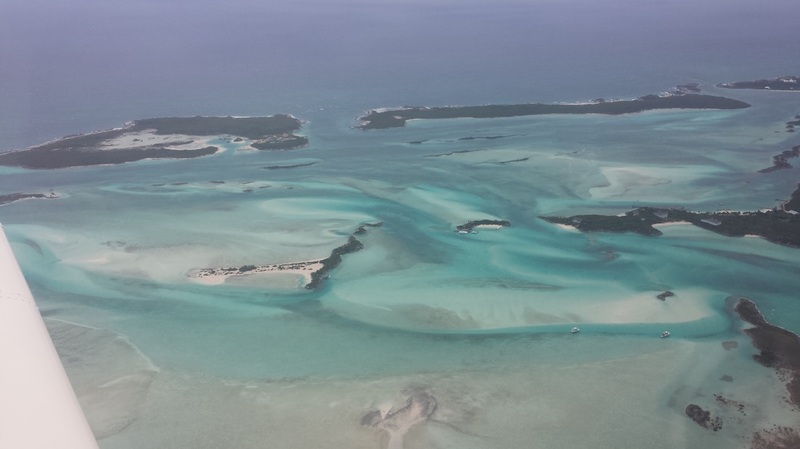 It's easy to appreciate all the different shades of blue, turquoise and sand from the air. 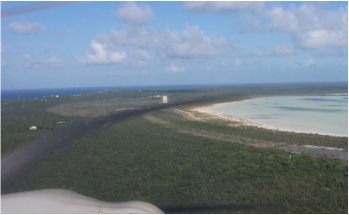 ​One of the benefits of flying yourself is, of course, the ability to spot places to visit later from the ground so, in Staniel Cay, we specifically spotted a few deserted islands to check out later with a boat. Here are a couple of islands you can walk to and from, across the water. Cool or what!? 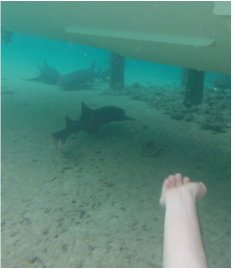 In addition to visiting those islands above, we also swam with and fed the wild pigs (picture below), snorkeled to Thunderball Grotto, swam with stingrays, saw huge iguanas (picture below), rode bicycles, attended a local religious ceremony, swam with and fed nurse sharks (the picture below shows Jared feeding them before the word got around and every shark showed up), and just cruised around with a rental boat. Great fun!! Looking out from the Staniel Cay Yacht Club where we stayed. As you can see, flying an Archer to the island is actually the "poor people's" way of traveling there. And those yachts got a lot bigger that afternoon. 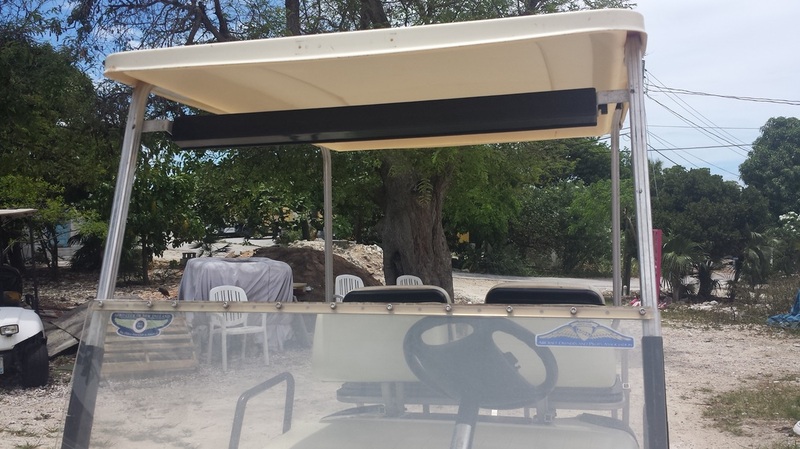 Some (I'm going to guess New England) pilot left a mark on Staniel Cay by way of putting AOPA and Aero Club of New England stickers on this local's golf cart. Pretty cool! It, at least, brought a smile to my face! Before heading to Cat Island, we flew around the places we visited with the boat, including the yacht club, "pig island," and Iguana Cay. We flew VFR, which is why there is no FlightAware track. While approaching the Airport (picture below), an ATR called in that they were close by and coming in for landing as well. 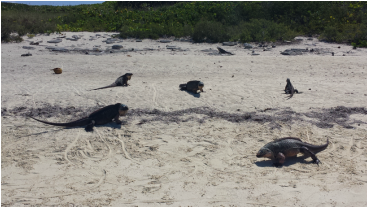 We could not see them and we were having trouble understanding them, so we decided to get out of the way and take a tour of the island until they landed. After all, we were on "island time" and sightseeing! We stayed at the Fernandez Bay Village close to the Airport because it is owned by a fellow pilot. We had an absolutely wonderful stay. The owners and their staff were very nice, attentive, and welcoming. In fact, we toured some of the island with some of his family members and staff. 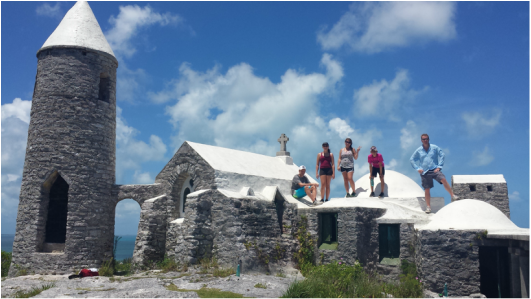 In Cat Island, we went "crabbing" at night (only keeping males), hiked to the highest elevation in the Bahamas (a whooping 206 ft above sea level) known as Como Hill and topped by a monastery called The Hermitage (pictures below from the ground and the air), walked along a pink sand beach (picture below), and swam in a little cove. 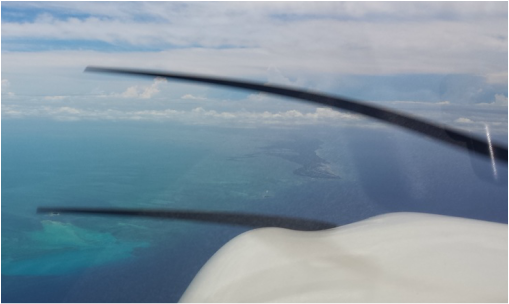 We flew VFR to Stella Maris also. Stella Maris is not only a port of entry but it also has fuel. Ding, ding! Important for us. This was the only island we spent two nights in and it was only because 1) we arrived late from Cat Island*, 2) it is not called Long Island for no reason (making it more time consuming to visit places while there), and 3) we knew we could not leave the island too late on a Sunday or else we weren't going to be able to clear Customs on the way back to Florida. * We arrived late from Cat Island but still during daylight. 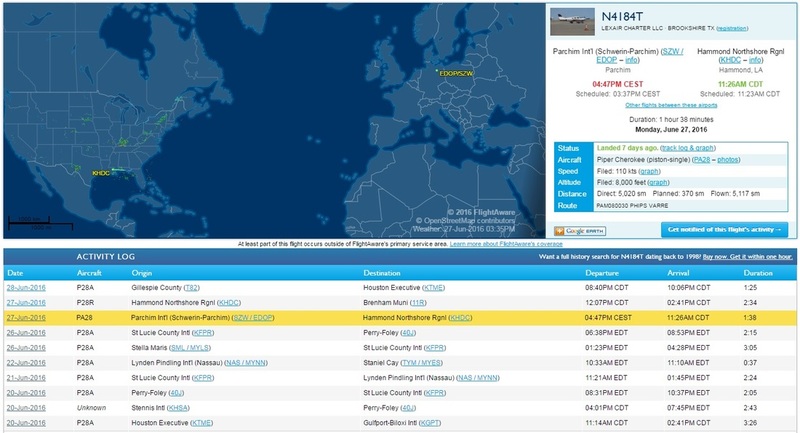 Keep in mind night VFR flying is prohibited in the Bahamas and I'm not sure many airports even have lights. And, regardless, we went to the Bahamas to sight-see. We can't do so at night! Long Island has some history in addition to great water activities. In love with these sights! On a long final after we had to extend our downwind due to traffic. Two other airplanes came in at the same time we ​did. We stayed at the Stella Maris Resort Club because, after being on Caribbean waters the entire trip, we wanted to experience the Atlantic as well. No regrets but, if you want a hotel on the Caribbean side, the Cape Santa Maria Beach Resort may be another good option. Erna's Nature Pool, although public, is in the same resort area. As you can see in the picture below, it is a calm pool of water protected from the Atlantic by rocks. Yet, you can still see and hear the roaring of the strong waves. It was a pretty cool place! And, even better, when shared with a Bahamian couple who were absolutely wonderful to us. 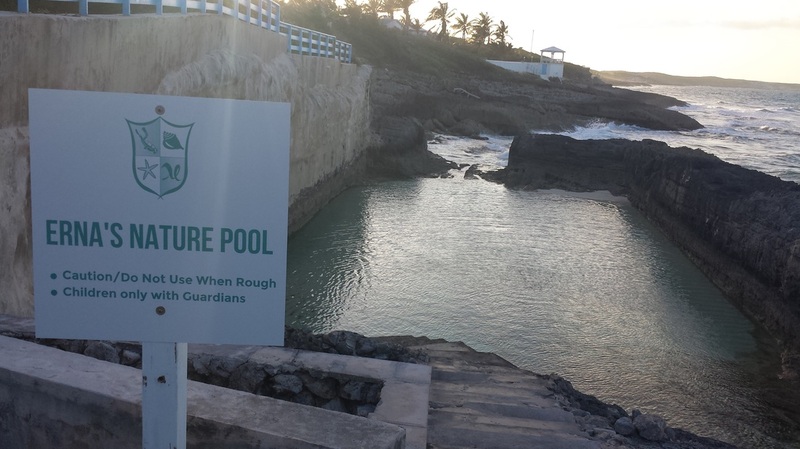 So nice that they even offered to take us to the Dean's Blue Hole the next day. Not a small undertaking as it is over an hour away, driving. Dean's Blue Hole is the deepest (663' deep) blue hole in the world and the second largest underwater chamber. It is enclosed on three sides by natural rock, and on the fourth side by a turquoise lagoon and powder white beach. It's beautiful, as the picture below illustrates. While there, we saw Michael Trubridge, his wife and two of his friends practice. 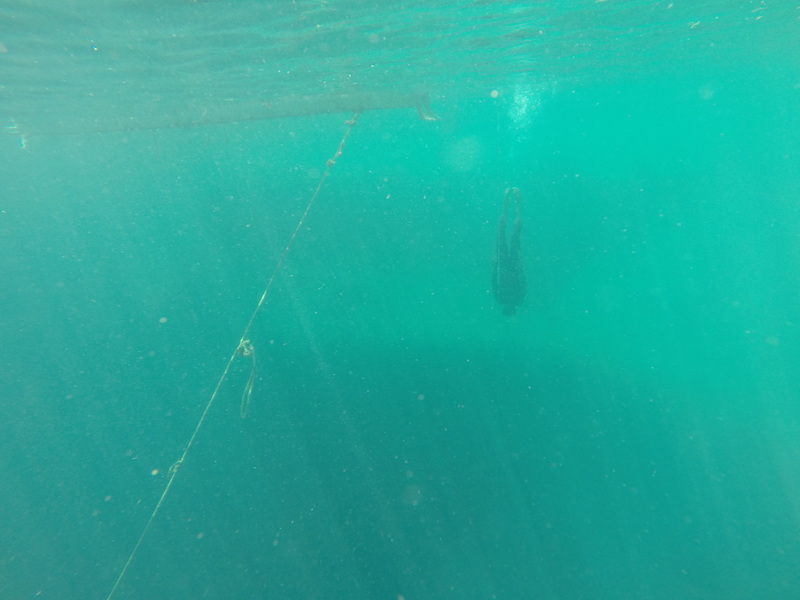 Michael has 15 world records, including a 132 m (~433 ft) free immersion/freediving record he achieved on June 16th, just prior to us being there, in the Blue Hole. When you have some time, you should look google him and watch some of his videos. ​The picture below shows him going down. Wow! Incredible discipline those guys had! 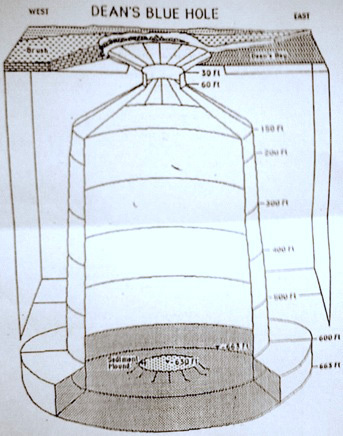 You can also see how the ground just drops off into the hole. But that wasn't all. We also had time for some walking, canoeing, history, and relaxation. Columbus Harbour is where Columbus anchored off and arrived ashore by long boat on October 16th, 1492. You can see the monument commemorating that on top of the hill, in the distance. Sigh! The day to go back home arrived. But not before a sightseeing a little more... and the picture below happens to show the mangroves (bottom right) and beautiful clear water we kayaked around to get to the Columbus monument (not picture but on the left of the picture). Getting fuel and clearing Customs at MYLS was truly a non-event. 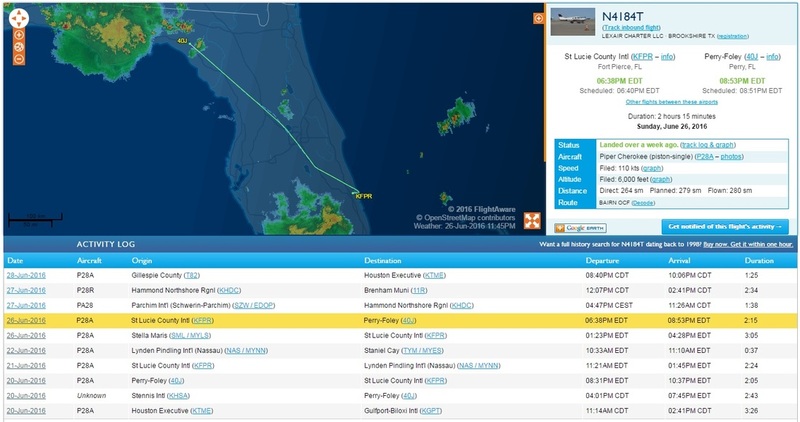 Even though we had filed our first international IFR flight plan via the FSS over the phone while in Fort Pierce, we decided to file an international (ICAO) IFR flight plan back using ForeFlight since our cell phone service was not the best. We also filed the eAPIS manifest using the iPad. Once you file one, it saves a lot of that information for future filings. It's quite nice! Keep in mind the manifests need to be filed at least one hour prior to departure. We filed both just before leaving the hotel while we had good wifi. No trouble at all. ​Clearing Customs at KFPR was also a non-event but a lot more involved. We had to park in a certain area of the ramp, unload all of our luggage (not as neatly packed as on the way there! ), and take ourselves and the luggage through the scanners at the Customs facility. We had to fill out the Customs Declaration form, they looked at our passports, and no other documents were requested. An agent walked out to the airplane and looked through the windows also; probably just to ensure we had taken all of our luggage out. Then we had to relocate the airplane across the ramp to the FBO. We really don't like going to the same airport twice. We like to spread the love and see what they all look like. But... the weather past Perry-Foley was not looking too great, we didn't have a lot of airport options with self-serve fuel, and we were a bit tired. Time to overnight! Little did we know... the taxi driver (the only taxi driver in town!) was going to be high and/or drunk and was going to overcharge us for the short drive to the Holiday Inn from the airport. I mean, $40, really? We were both pretty upset. That was the single most expensive thing we paid for during the entire trip and it was in a little sleepy town in rural Florida. Thankfully the airport manager was very understanding and picked us up the next morning. Side note: Did you know Hammond Air Center gives you a 6-pack of Abita beer when getting a top off? Hubby was happy that night! I love this map idea at Hammond Air Center. Jared and I marked the four islands we visited on the map. And that marked the end of our flying vacation. I am omitting the last two legs since they were business related. Wow! We (pilots) sure are privileged! 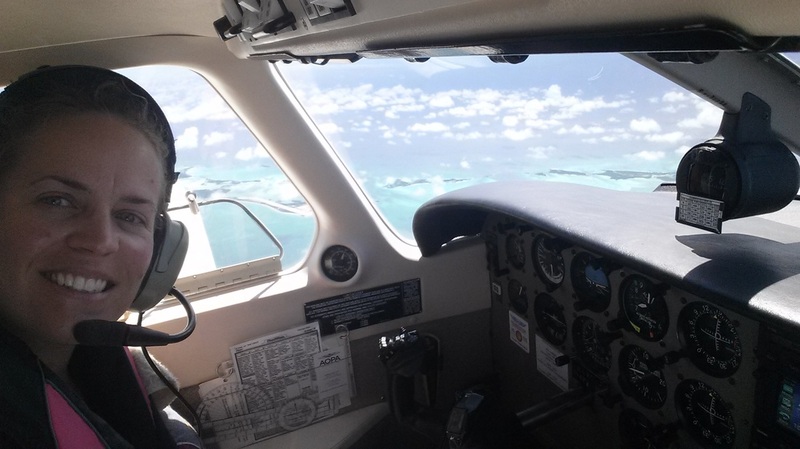 This type of trip would not have been possible without a general aviation airplane so, if you're a rusty pilot, get unrusty and enjoy these awesome benefits and, if you're not a pilot, you may want to consider it ;) You are truly missing out! ​To me, to live is to travel! Get out there and enjoy!